Dell Wyse 3020 - Zero client - DTS - 1 x ARMADA PXA2128 / 1.2 GHz - RAM 2 GB - flash 4 GB - GigE - Dell Wyse Zero Engine - Monitor : noneEmpower your team with enterprise-class thin clients on an entry-level budget. 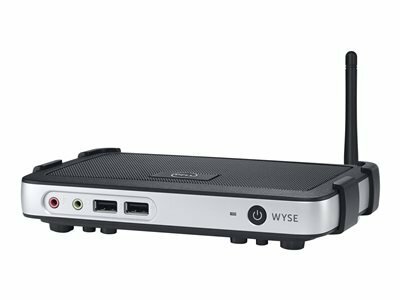 3000 series thin clients feature a wealth of premium Wyse cloud client features, and unlike traditional budget clients, 3000 series thin clients are ready to connect to almost any environment, including web-based applications and services. 3000 series thin clients can quickly process virtually any daily task with powerful System-on-Chip (SoC) processors. A built-in hardware media processor helps deliver smooth imagery, bi-directional audio and flash playback performance. The 3020 thin client offers even greater functionality with support for up to two digital displays, a dual-band Wi-Fi option and Microsoft RemoteFX certification for high-end graphics.